I read Remarkable Creatures by this author and loved it. I own Girl with the Pearl Earring and the Lady and the Unicorn but haven't read them. This sounds like a good one! I have to give this book a try. I've read "The Girl with the Pearl Earring" and thought it was good. I really enjoyed Girl with the Pearl Earring and Virgin Blue, I'm excited after reading your review to read this one as well! I bought this one after I read and enjoyed Girl with the Pearl Earring, then promptly forgot about it. Thanks for the reminder! I also really enjoyed The Girl with the Pearl Earring, and that first sentence would hook me as well :) Sounds like a book worth picking up! This was actually the first Chevalier book I read and I really enjoyed it. She does a great job capturing the essence of a historical period while still creating characters that the reader can relate to. The story was very original too and I liked that it was not predictable. I liked your review of this book! I'm actually doing a giveaway of it on mine! I read this years ago and it has been one of my favorite books ever since. I've reread it countless times. I'm always really glad to see other people enjoying it! Thanks for the lovely review! This sounds interesting. I haven't read 'The Girl with the Pearl Earring' but I've heard only good things about it. I think I'll put this one on my 'to-read' list. I just ordered it. It sounds great! I loved "Girl with a Pearl Earring" as well. This one needs to be on the TBR list too - especially after you shared that opening sentence! Talk about a hook! I linked this as part of my Friday Five at Kate's Library. 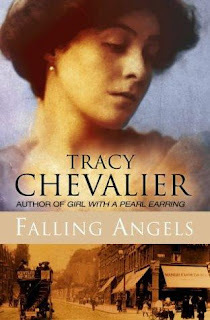 I think this novel was the first Tracy Chevalier I read, but I loved it. I should really re-read it. I have enjoyed all of her books, but there's something just a little more magical about this one. sounds like a great read, I've really enjoyed both the girl with a pearl earring and the lady and the unicorn so I must read this on soon!